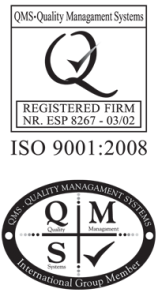 In 2001, the Besalduch analysis laboratory obtained the EN-UNE-ISO 9001:2000 quality assurance certificate No. ESP 8267 and became the first laboratory on the Balearic Islands to do so. Said certificate was recently revalidated after external audits by the company QUALITY MANAGEMENT SYSTEMS.